Do you use data when using iMessage on your iPhone or iPad? Does iMessage Use The Internet? This article is meant to show how iMessage, Apple’s official instant messaging application utilizes the internet to send and receive messages across all Apple devices. If you have an iPhone, you likely already know about iMessage. It is a built in messaging application that runs a lot like WhatsApp, allowing you to send texts, media, locations and more to anyone else using iMessage. This service only works on Apple products, and sign in and handling of messages is done through the Apple ID you have. Much like every other message app out there, you need a connection to the internet via your mobile data or wifi in order to use the application, but unlike some of the other popular messaging apps out there like WhatsApp and Messenger, this app can send a message even without an internet connection as an SMS. Whenever you get a new Apple device, you are required to set up an Apple ID/iCloud that ties into the phone number associated with the device and an email associated with it as well. This is what allows someone to send you iMessages. So, you compose a message and hit to send it. 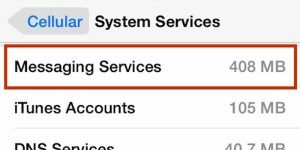 Immediately Apple is pouring through its database to determine if there is an Apple ID associated with this number (which would send an iMessage) or if it doesn’t (which would send a traditional SMS message). 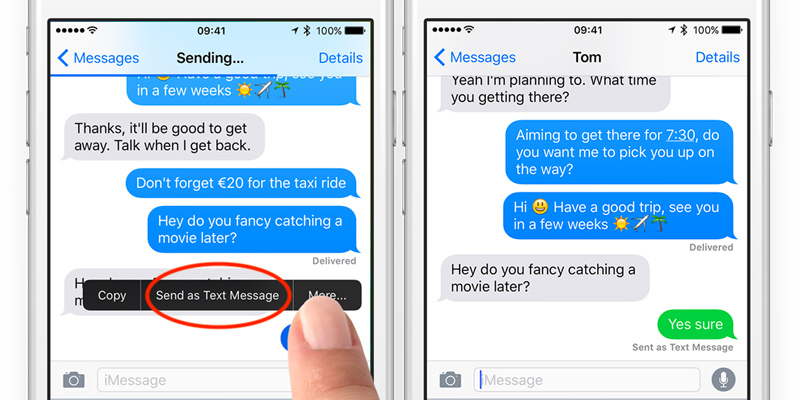 SMS vs iMessage: What’s So Different? Now, you would wonder that the difference is between these two approaches, if SMS uses internet data on your iPhone, and more. There are a few differences, and I’ll be sure to point them out below. SMS stands for Short Message Service, but is more commonly referred to as a text message. To put this simply this is a text sent between two cellular devices. It is short because the maximum available characters for one text message is 160, and as little as 70 characters with alphabets like the Chinese. But how do these messages actually arrive at your phone? Even without an active connection with someone else via voice or otherwise, your cellphone is actively sending and receiving information all the time. This information highway connects your phone to the nearest cell phone tower via a control channel. This message relays through that tower and disperses a sent text message as a small data package directly to your phone via the control channel. Sending a message works the same for your recipient. iMessage texts are different because they do not use your data plan to send messages, but rather use the internet itself. Additionally, there is more than just SMS available to send through iMessage, such as all types of media, your location, and many other data types. This service allows you to text over a WiFi connection, which can actually save you a lot of data (especially if you like to send attachments and videos). Using the wireless internet instead of your carrier’s data plan ultimately saves you money. Another difference is how much faster iMessage is than using SMS. Different tech is used to make a text message able to be sent and received over a cellular network. So, just using the regular internet, large media files are much faster to send than MMS (the multimedia form of SMS) messages. One more perk is using iMessage internationally with no incurred charges, helping you stay connected to your family and friends. You can also send messages without a WiFi connection as an SMS message by simply long pressing the send button, or turning on the feature that automatically detects when you are missing an internet connection and sends an SMS instead. If you are an iPhone user, you might also have noticed that some of your messages are blue and some of them are green, any idea what that means? The blue ones are message that have been sent using iMessage technology and green ones are send via traditional SMS channels to your recipient. If you are running the latest version of iOS, this information is simple to find. You can both track the data usage and control it based on your limits. The largest part of this data exchange happens when you send and receive media messages like photos and videos. Texts are typically very small in size, which does not require much data to send. iMessages use your data plan as well if you are not connected to Wi-Fi. Try staying connected if you plan on sending and receiving larger files regularly. I can hope that you better understand the differences between the iMessage service and standard SMS texting and how iMessage can use the internet. If you still have questions or concerns, drop a comment below in the box and I’ll get back with you. Thanks for reading.